Oil & Natural Gas Corporation (ONGC) Has invite applications for the recruitment for Technician, Junior Assistance & other more vaccines . 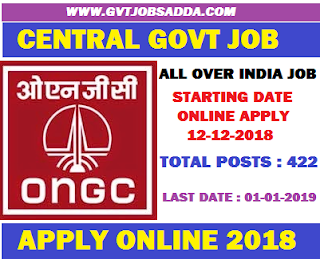 Those candidates who are interested & eligible for ONGC Recruitment 2018 Candidates may check official Advertisement & read all notification carefully ad apply before last date of online apply. ONGC Recruitment 2018 Brief Information Has Given Below. A. [ High School or Class X equivalent Board Examinations with : (i) Second class Certificate with Proficiency/ Competency in Marine Radio Operation Recognized by Govt. of India with Global Maritime Distress and Safety System (GMDSS) certification issued by the Ministry of Communication (MoC) and one year experience in line. Intermediate with 6 months’ training/experience in Security. Physical Tests apply. 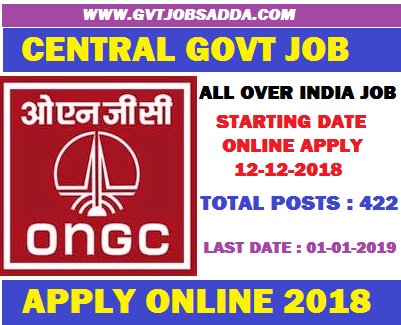 Eligible candidates would be required to apply on-line ONLY through the link available on ONGC Website: www.ongcindia.com from 12/12/2018 to 01/01/2019 till 1800 Hrs. No other mode of application shall be accepted.